Alzheimer’s Genes in the News: What does it all mean? Most Alzheimer’s researchers agree Alzheimer’s largely is a genetically driven disease. Environmental factors such as age, gender, stroke and head injury have profound influence on when the disease becomes manifest, but a person’s genetic make-up greatly influences risk for the disease, usually by working together with one’s life exposure factors. Most Alzheimer’s researchers agree with this statement: common late-onset forms of Alzheimer’s and Parkinson’s disease are now believed to involve substantial inherited risk. Dr. Tanzi, who is supported by Cure Alzheimer’s Fund, was an early believer in this statement and has based his extensive research over three decades on it. 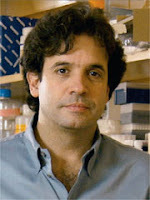 Dr. Tanzi had early success in making the link between genetics and risk; he co-discovered the first and three of the original four established AD genes in the 1980s and ’90s. Since then, Dr. Tanzi and his team have been employing sophisticated, family-based methods to identify new AD candidate genes that confer risk or protection for the disease. In 2008, Dr. Tanzi reported the first findings of the Cure Alzheimer’s Fund Alzheimer’s Genome Project™ (AGP). These were the first AD candidate genes to be reported from a screen of the entire genome in which statistically significant evidence (genome-wide significance) was obtained for association with AD risk. In 2009 and 2010, groups in Europe and the United States reported four more genes from human genome screens that were associated with AD risk with statistically significant results. Dr. Tanzi and others reported theses results in Barcelona. Most recently, on April 4, 2011, two new Alzheimer’s papers were published by two large Alzheimer’s research consortia, one European and the other American (Alzheimer’s Disease Genetic Consortium [ADGC]) supported by the National Institute on Aging. Dr. Tanzi, an ADGC member, is a co-author of the American consortium paper. These studies reported four new Alzheimer’s candidate genes. This means that since 2008, 12 more candidate genes have been confirmed for influencing risk for the common late-onset form of AD. In addition, Dr. Tanzi recently identified two rare mutations in yet another gene that appears to strongly increase risk for AD at about 70 years old. The latest findings bring the total number of confirmed AD genes to 17. These 17 different genes now shown to be significantly associated with AD risk—as confirmed in multiple independent AD sample sets or families—are joined by many more genes that also have been associated with AD in at least four independent case-control samples and that are listed on Cure Alzheimer’s Fund-supported Internet database AlzGene. These associated genes are well on their way to being confirmed as AD genes. In addition, On top of all of this, the AGP has identified more than 100 additional AD candidate genes, which are now in the testing pipeline to determine which, if any, will join the ranks of the 17 established or confirmed AD genes. What is an Alzheimer’s gene? How many Alzheimer’s genes are there? There are approximately 25,000 genes in the human genome. A gene’s job is either to make proteins or control the activity of other genes. In the perfect biological system, genes make proteins that allow the system to run smoothly and normally. Over time, genes can change or “mutate” from their original function and, for example, produce proteins that are variations of the “original” form. Or, mutations can cause genes to produce the wrong amounts of proteins. Genes of all kinds can carry several mutations or variants, many of which are harmless and simply help engender subtle differences among humans. Trouble arises when a gene mutation (or variant) causes or predisposes to disease. It should also be mentioned that some gene mutations and variants can instead confer protection from disease. Therefore, an “Alzheimer’s gene” is a normal gene that, when inherited with certain mutations or variants, either can increase risk for or provide protection against the onset of Alzheimer’s disease. The most fundamental approach to “curing” a genetically driven disease, then, is to a) find all the genes that determine risk for a particular disease; b) determine which ones are the most significant contributors to the pathology; c) determine which genes (and their protein products) are most amenable to drug discovery; and d) determine how to stop their ill effects while not compromising their original job or mission within the body OR damaging the function of other genes and proteins that contribute to good health. First, how do you find them? The newly related discoveries about “new” genes can be confusing because the various papers work from differing base definitions. For example, the newest AD gene papers published on April 4, 2011, say the field has moved from five AD genes to 10. These numbers are not accurate as they only correspond to a limited number of studies and do not fully capture the entire AD genetic landscape as described in the published literature. Let’s start with how genes are identified in the first place. Current technology facilitates gene “discovery” through Genome Wide Association Screens or GWAS. The DNA purified from the genomes of Alzheimer’s patients and non-Alzheimer’s patients are screened via sophisticated equipment and chips and then analyzed statistically to find mutations and variants in our genome that differ in the prevalence between AD patients and unaffected elderly subjects. The most commonly employed GWAS study design is the “case-control” study, in which up to a million DNA variants spanning the entire human genome are compared for their prevalence in thousands of confirmed Alzheimer’s DNA samples versus thousands of control or non-Alzheimer’s-affected samples (that have been matched to the cases according to age, gender and ethnicity). Variants that are over-represented in the AD cases are thought to confer risk for Alzheimer’s when inherited, while those that are under-represented are thought to confer protection. The genes that contain variants that associate with either risk or protection for AD in a statistically significant manner then are considered candidate AD genes. Once the association of AD with the gene variants is replicated in additional independent AD samples, the candidate AD gene is considered to be confirmed. The gene remains only a confirmed candidate AD gene until the actual defect in the gene that biologically affects the Alzheimer’s disease process is determined. For any given gene, this defect can be a DNA mutation, a DNA variant, a DNA deletion, a DNA insertion or a DNA rearrangement. When the gene defect is clearly determined and validated in animal models of the disease, the candidate gene then becomes an established AD gene. Currently, we have four genes that meet the criteria of established AD gene: APP, PSEN1, PSEN2 and APOE. Most recently ADAM10, which was identified in Dr. Tanzi’s lab as part of our Alzheimer’s Genome Project™, also has been proposed as an established AD gene. This is because all five of these genes have been shown to contain pathological mutations, or in the case of APOE, susceptibility variants. Once AD genes are established, drug discovery around these genes can begin in earnest. However, there also are examples in which drug discovery begins before an AD candidate gene is established and still is classified as confirmed. Currently, all of the established AD genes are guiding drug discovery efforts in pharmaceutical companies and universities, including those being supported by CAF. Note: Often in press releases and media reports about purported “new Alzheimer’s genes,” the reference almost always is to a candidate gene rather than an established Alzheimer’s gene. And, sometimes the reference is to an Alzheimer’s candidate gene that has yet to be confirmed—hence the swirls of confusion. The other kind of GWAS is “family-based,” in which families (preferably thousands) experiencing AD in multiple first-degree relatives are analyzed genetically. This study design allows for a more rapid process to find gene defects, since one can assess co-inheritance of potential gene defects. In other words, one can check, family by family, whether the gene mutation or variant is specifically being inherited in the patients but not their unaffected family members. This means family-based studies, although more challenging in terms of statistical analysis, are ultimately more promising, as they can more rapidly lead to determination of the actual gene defects—and so-called confirmed AD genes that guide drug discovery. Dr. Tanzi traditionally has focused on AD families for his AD gene discovery efforts. The work of Tanzi and his colleagues on the Cure Alzheimer’s Fund’s AGP™ is the largest family-based GWAS for AD. The critical difference in terms of the types of genes discovered in these two types of genome-wide studies is that the case-control study facilitates the identification of many highly prevalent gene variants common in the general population, but that most often have only tiny effects on risk, e.g., increasing or decreasing risk by only 10 percent to 20 percent. The family-based approach often identifies rare mutations and variants that only may cause AD in dozens of families, but which have very strong effects on risk. As such, the genes from family-based vs., case-control GWAS do not always match up. Dr. Tanzi and Cure Alzheimer’s Fund have favored family-based GWAS since they historically lead more readily to drug discovery. However, both case-control and family-based GWAS are needed to identify the full cadre of AD genes, including those with high and low prevalence in the population and those with large and small biological effects on AD risk. In the end, even if a familial gene mutation is rare, once it is used to guide drug discovery, the expectation is that it will help in all cases of Alzheimer’s. Meanwhile, the many gene variants with small effects on risk, deriving mainly from case-control studies, someday could be used collectively to predict risk for AD early in life, so that effective drugs, e.g., guided by gene discovery, can be used to prevent Alzheimer’s before it strikes. This “Early Prediction-Early Prevention” strategy is often referred to as “personalized medicine,” or pharmacogenetics. So how many Alzheimer’s genes are there? Four confirmed AD genes have been known to the Alzheimer’s research field for more than 20 years. Three of these genes—amyloid precursor protein (APP), Presenilin 1 and Presenilin 2 (PSEN1 and 2)—were co-discovered by Tanzi and his colleagues. All of these Alzheimer’s genes are strongly penetrant and essentially guarantee the onset of early-onset Alzheimer’s disease (usually found in those younger than 60 years old). The fourth gene, APOE, was discovered by a group from Duke University led by Dr. Allen Roses. APOE has been the “granddaddy” of regular or “late-onset” genes. It contains a variant called epsilon 4 that is present in about 20 percent of the population in general and in greater than 50 percent of those with Alzheimer’s. Unlike the early-onset AD gene mutations, this variant does not guarantee AD, but serves to increase risk. Inheriting one copy of the variant increases risk fourfold vs. the general population; inheriting two copies increases risk more than 10-fold. However, a person can carry the APOE gene variant and not have or get Alzheimer’s in a normal lifetime. Most recently, the Cure Alzheimer’s Fund Alzheimer’s AGP™ has identified two rare pathological mutations in the gene, ADAM10. These mutations were found in only seven of 1,000 AD families tested and appear to strongly increase risk for AD at about 70 years old. Based on these finding, ADAM10 has been proposed as the fifth confirmed AD gene; it is currently undergoing the steps described previously to become a confirmed AD gene. In 2008, Dr. Tanzi and the AGP™ reported the first four newly identified and confirmed AD candidate genes from a family-based GWAS in a paper lauded by TIME/CNN as among the 10 Medical Breakthroughs of 2008. These genes—ATXN1, CD33, GWA14Q34 and DLGAP1—are being analyzed in AD families to identify the disease-causing gene defects. CD33 is perhaps the most interesting, as it is not only associated with Alzheimer’s disease risk, but also controls the brain’s innate immune system. In another recent Cure Alzheimer’s Fund project, the amyloid beta protein, which makes up the senile plaques in AD patients’ brains, was found to play a role in the brain’s innate immunity system. In 2009–2010, four more confirmed AD genes were found in case-control GWAS—PICALM, CLU, CR1 and BIN1. And in April 2011, the U.S. and European consortia reported the results of large case-control GWAS, which CD33—first identified by Dr. Tanzi in 2008—as an AD gene. The consortia also confirmed PICALM1, CLU, CR1 and BIN1, and reported finding four more confirmed AD genes: MS4A4/MS4A6E, CD2AP, EPHA1 and ABCA7. So to make sense of this all, how many confirmed AD genes are there now and how strong an effect do they have on AD pathology? There are arguably five established AD genes plus the four confirmed candidate genes published by Tanzi as part of the Cure Alzheimer’s Fund AGP™ screen in 2008 plus the eight from the case-control consortia. So the actual new total is 17 confirmed or established AD genes: three genes for early-onset AD and 14 genes for late-onset AD. Most Alzheimer’s researchers agree Alzheimer’s largely is a genetically driven disease. Environmental factors such as age, gender, stroke and head injury have profound influence on when the disease becomes manifest, but a person’s genetic make-up greatly influences risk for the disease, usually by working together with one’s life exposure factors. Therefore, knowing ALL the genes that contribute to AD risk or protection, and especially which ones contribute the most to risk, are essential clues for researchers developing therapies to effectively treat or prevent the disease. So far, all the drug therapies that have been developed or are in the pipeline to combat the disease have been based on knowledge learned from those first four genes (mainly the three early-onset AD genes) discovered more than 25 years ago. Now, with more targets affecting more and different biological pathways, researchers can take many more “shots on goal” to come up with truly effective therapies to stop the disease from progressing, reverse its progress or prevent it from occurring in the first place. We have come a long way in AD research and genetics continues to lead the charge. The work of labs around the world, collectively and individually, is contributing to increased momentum toward the development of effective treatments for the disease. As consensus around the science of the origins of the disease coalesces, it is even more important to find the resources to support that science and accelerate the development of effective therapies. The ultimate goal is to someday use the entire set of confirmed AD genes (likely greater than 100) to predict the disease early so as to prevent it with effective therapies before it strikes. These same drugs also would be expected to provide benefit to current AD patients. These studies are driven by gene discovery efforts, and Cure Alzheimer’s Fund is continuing to drive this process forward at all levels, from gene discovery to drug discovery. Alzheimer's A Sudden Flash of Genius?